Flex is a US-based global electronics manufacturing giant, with a market cap of over $25B and over 200,000 employees globally. As leading global solar panel manufacturer, Flex saw an opportunity to apply its expertise and provide value to customers around the world by developing a complete solar solution spanning panels, inverters, storage, and in-home energy optimisation. 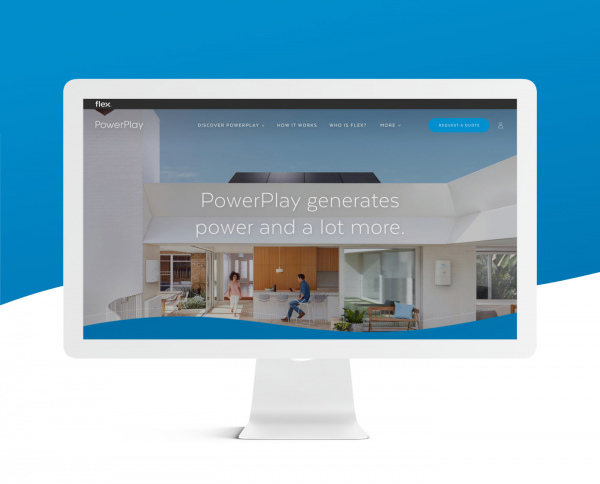 The resulting product was called Powerplay, and we were engaged by Flex to deliver a state of the art website experience. 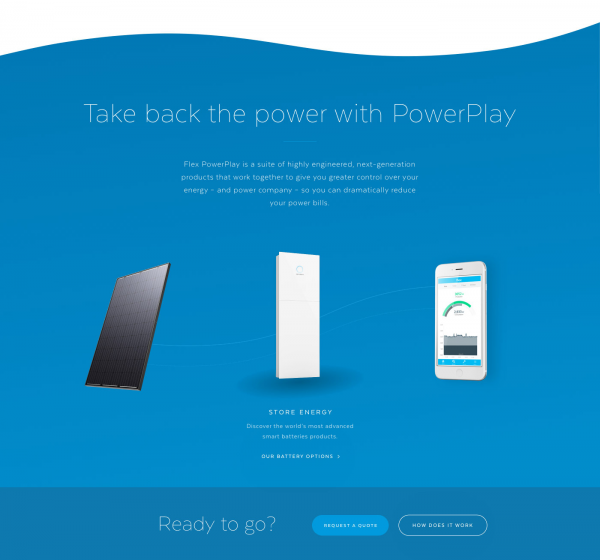 Described as a “next generation suite of solutions,” each element of PowerPlay gives customers control over energy use and cost. PowerPlay is a fully integrated, scalable solution compatible with many popular home automation technologies. What made this engagement unique is that our task was to develop one website property that would accommodate two distinct markets: Australia and the United States. Through market research we learned these two groups have different motivations for making the switch to solar; therefore, we devised a solution that would deliver a customised experience depending on the user’s location. We configured the site’s backend in a way that allowed for certain components to be shared across both experiences, whilst still accommodating differences in products, specifications, and positioning. To make what is otherwise a complex subject more accessible and palatable to the general public, we segmented the PowerPlay product into three core concepts: Generate, Store, and Optimise. This product narrative continues through the website linear design and inspired a simple, sleek user experience. Our objective for this end-to-end website development project was clear: create a solution that catered to both American and Australian markets. Although there is one web property, a user’s location determined which journey he or she is presented with on arrival; this is due largely to differences in product availability. To power these location-specific experiences, we configured the platform in a way that content could be shared across and modified as needed. Because the average consumer’s knowledge of solar power is limited, our task was to position PowerPlay in a way that was both authoritative and accessible. 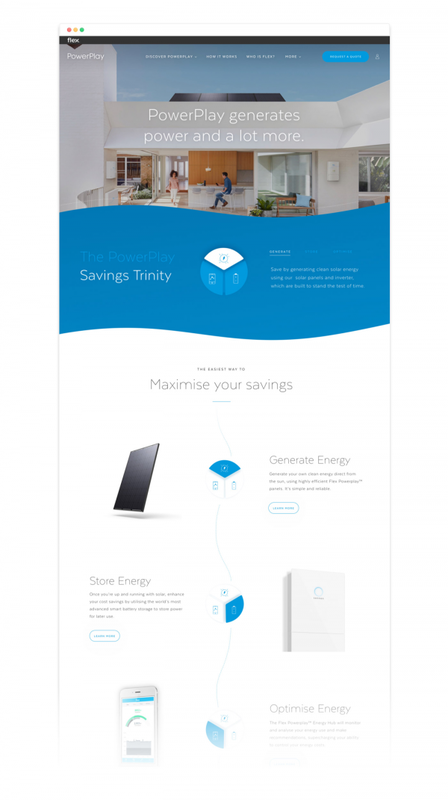 Backed by Flex’s long-standing reputation for manufacturing top quality solar panels (among other products), the website was to be designed in a way that users became educated, familiar and interested enough with the PowerPlay “trinity” of features as they journeyed through the website that they would be comfortable to enquire further. 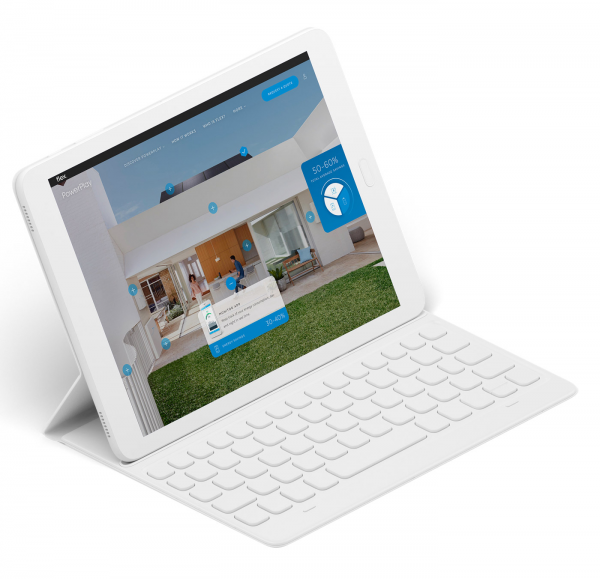 While there are plenty of inverted, panels, and smart home optimisation solutions currently on the market, finding products that can successfully integrate has historically proved challenging. This is the problem PowerPlay sets out to fix. Flex created PowerPlay as a separate entity solely focused on product sales to American and Australians consumers. 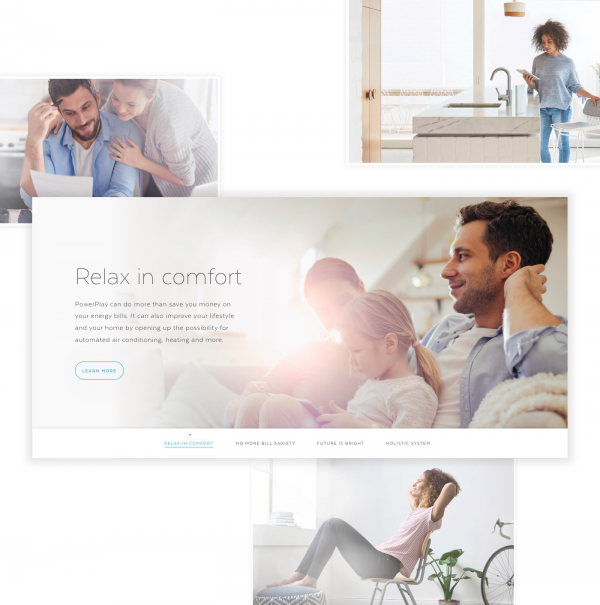 The website is primarily conversion focused, but uses a narrative approach to take what is normally considered a complex commercial solution and transform it into something the average consumer can take in, understand, feel inspired by, and wish to purchase. Our market research revealed that cost-savings was a primary user benefit across both American and Australian markets, but secondary benefits differed: where Americans are motivated by control over cost, energy consumption, and technologies, Australians resonate with eco-friendliness and energy independence. 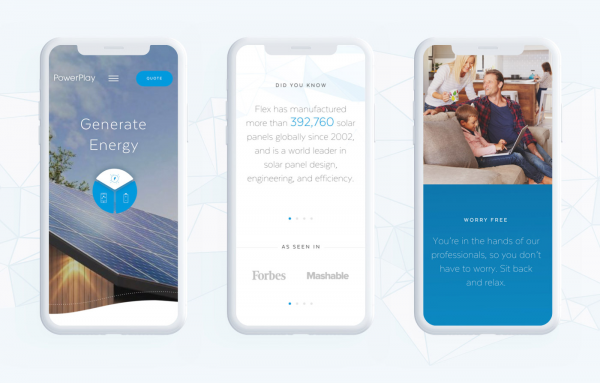 These insights prompted us to slightly modify product positioning and key messaging to ensure users felt connected to and inspired by the PowerPlay solution. 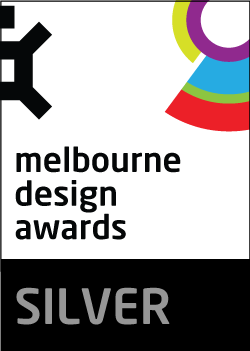 The resulting design is light, airy, and built inline with the Generate/Store/Optimise narrative. Information is only ever presented in small, manageable chunks, with the option to journey down the page and onwards to the next segment in the sequence. The intent is for users to become acquainted with each unit individually before witnessing them working in harmony, and then submitting an enquiry for a quote. We designed a tethering nav to keep the Generate/Store/Optimise segmentation prominent and accessible. 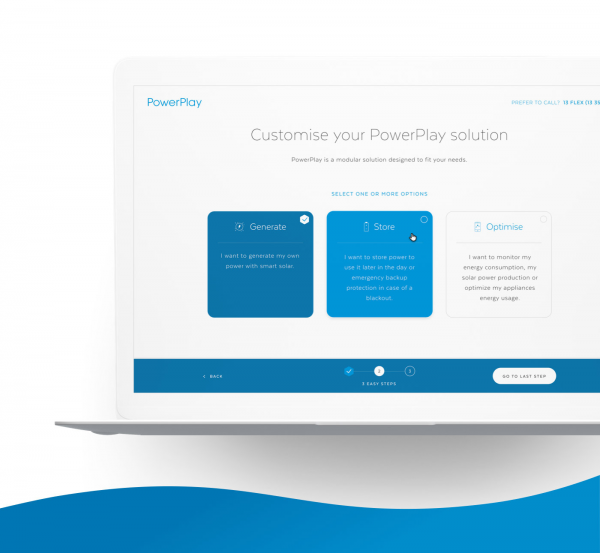 Across both journeys, we wanted to make it as easily and seamless as possible for users to come to appreciate PowerPlay as a convenient plug-and-play solution. Because Flex have internal marketing capacity, our team was not engaged for post-launch marketing activities. However, in addition to the full website redevelopment (which included advanced keyword research and SEO), we produced a complete content strategy for the team to use as a reference when populating website content and other marketing communications collateral. Standard privacy procedure was followed in accordance with best practice on all contact forms and other areas of the website where personally identifiable data was collected. In addition we ensure that no personal information is passed through Google Analytics (eg. email addresses). Regular penetration testing is conducted to ensure the site and server are secure. The website, hosting and infrastructure pass this testing with no significant issues identified.